These are hard times for those pursuing a so-called “higher education”. All around the world, state and regional governments continue to implement strict neoliberal austerity policies aimed at slashing social spending and transferring more and more public wealth to the rich. As a result, the burden of financing educational institutions has increasingly fallen on students themselves – often in the form of rising tuition fees and skyrocketing levels of personal debt. In societies with entrenched levels of social and economic inequality, these high tuition costs bar large segments of the population from accessing these institutions altogether… which in turn helps to cement preexisting divisions based on class, race and gender. Meanwhile, those who are able to scale the walls of the ivory tower are increasingly graduating into economies with paper degrees that do little to secure them well-paying careers. Instead, these students often find themselves forced into hyper-exploitative internships, or precarious jobs where they must toil for decades to pay off their student loans. In this month’s edition of Trouble, the second in a two-part series marking the 50th anniversary of the student-led uprisings of 1968, sub.Media continues to shine a light on contemporary student struggles from around the world. 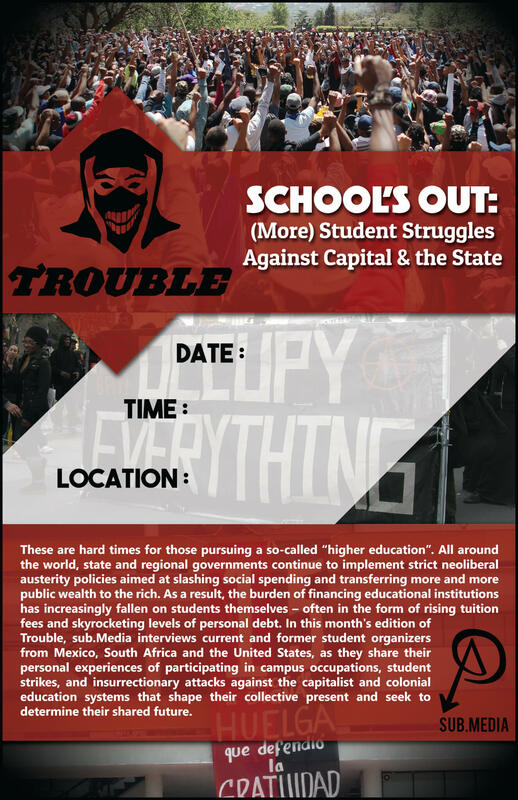 This episode features interviews with current and former student organizers from Mexico, South Africa and the United States, as they share their personal experiences of participating in campus occupations, student strikes, and insurrectionary attacks against the capitalist and colonial education systems that shape their collective present and seek to determine their shared future. A look at Putin’s nukes and the recent arrests of NYC Critical Mass participants. Fedbook founder Lil’ Zucky’s been in the hot seat this week, in the wake of the Cambridge Analytica scandal, where up to 87 million peeps’ data was used to help the Orange One get elected. In this week’s episode of TFN, Stim breaks it down for y’all.